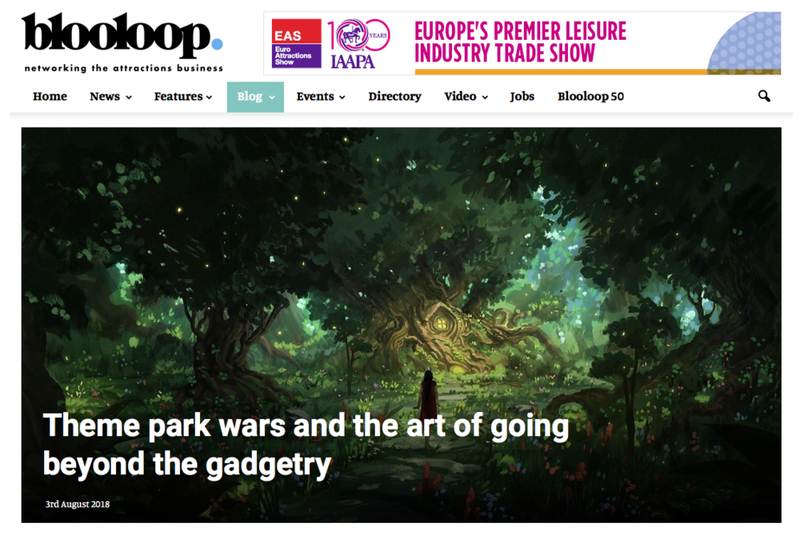 Blooloop Interview: Theme Park Wars. News from the front. SSLA applauds Stan Lee becoming first "Icons of LA" award recipient. Eddie Sotto, Stan Lee, and Rosemarie Piccioni. I was surprised to hear a colleague of mine express his desire to leave the innovation lab that he had been with for years. More surprising was his reason. It wasn't more money, a neurotic boss, or a cabin in Montana. It was about passion. I assumed that he'd burned out and needed a change. Nope. He was told by top management that the company frowns on the passion he exudes toward developing concepts, and that his kind of passion is a quality they wanted to discourage. Being a passionate designer by nature (and Italian), I found this to be a disturbing comment and wondered if it was something offensive he said, or his being unreasonable. He assured me that he was told that "passion" was not a positive quality in the creative process. Stop insisting on getting it right? Just ship "good enough"? How could it be possible that within a creative culture, where corporate, (to sniff out good ideas from bad), tests their "creatives" by measuring how passionately they fight for your projects? Disney CEO Michael Eisner wrote a memo once encouraging me to always remain passionate. He scrawled "Never say die! Don't give up till they drive a stake in your heart, and then get up and try three more times!" Years earlier, Eisner himself was known for laying on the floor of Paramount Studio Chief, Barry Diller's office, blocking his desk until he heard a "yes" to making a little film called "Raiders of the Lost Ark". Diller realized that "Mike most know something we don't". So it got the green light. That story inspired me to pitch to my boss, Disney Imagineering chief Marty Sklar what ultimately became "Mission:Space", a theme park attraction. We had no budget to produce a presentation, but a unique idea for a Rocket ride. In the hallway outside Marty's office, I explained the experience by laying on my back looking skyward in a suit and tie, mimicking the mission control com-chat, pretending to fly the Space Shuttle, suspended between two office chairs! Making due, it demonstrated the unique guest experience of vertical blast-off. At first, I think he wanted to call Security, but in the end, Marty saw the potential and funded development. "Mission:Space" has been part of Walt Disney World's EPCOT Center for more than a decade. This passion thing still did not pass the smell test. Why would someone in a creative organization discourage it? Maybe it's not the passion, it's the side effects. Ask your doctor if passion is right for you. The dark side of persistence. In all fairness, a "can-do" attitude can lead to lots of problems, as your team might believe they can do something they may not be qualified to do, or worse, rise to the occasion. Passion can jump to premature conclusions when improperly applied. Enthusiasm is contagious, hard to manage, and managers are scolded when the creatives run wild. At one firm, our team was told to stop this "can-do" spirit because their engineers were getting too excited and who knows what would happen then? They might actually invent the future! True story. On the same token, being overly passionate, especially if you are persuasive, could lead into follies of design, goose chases and fiscal disaster, no? I guess it depends on knowing the goose you are chasing, when to make your case, and then backing off before you are thrown off the cliff. Being a creative design consultant and working with many think tanks, you sometimes run into a darker reality that even passion cannot resolve. Some innovation departments might exist as Wall Street window dressing. In truth, some corporate cultures may not really be rightly disposed to actualize big ideas, as the upper management is timid. "Are we looking for refinements or breakthroughs?" It's a fair question to ask. There can be a built-in series of fiscal and operational filters that kill ideas no matter what, kind of an administrative "No" it's been called. You are encouraged to think "outside the box", but have to invent within it (Does it have to be a box?, why not a bag?) We've all seen the process where companies take a fresh idea and "puree" it in the "blander". Passion "jams the blades" so to speak, when you are the lone dissenter to the status quo. It's true that arguments that are emotionally driven without reason or pragmatism almost work against the idea. Passion may be best applied in measured doses and endurance fueled by a sound rational argument. Creative groups are hard to deal with as inspiration cannot always be scheduled, so some posture obvious product refinements, as "breakthroughs". Making it thinner, faster, smaller, wider, based on the hit movie, anything but original. Today with focus groups, retina tracking, data mining, demographic and psychographic studies and more, management sometimes thinks intuition and gut instinct can be replaced by quantitative and predictive research. Why invent? let the data tell us. To a degree it works well. "The wise one listens" and that's true. I recall a Disney Studio strategic planner looking at bad quarterly results saying to the film Producer "Why don't you just make the "hit" movies?" Kind of says it all. Creativity unleashed is a messy and powerful force. There is room for structure, good research, planning and informed ideation, but it's easy to forget that instinct is what drives the "mind's eye". I've found that surveyed people respond, rather than create, so you have to dream it and take them beyond their imagination. Great projects have passionate champions that incite others to rally around the vision. When you are the only one who can literally taste an experience that has never existed, expressing passion is a part of bringing the "unseen" to others along with you. Walt Disney said, "It's kind of fun to do the impossible." Passion is worth fighting for.